Save $3.00 when you buy any ONE Align Probiotic Supplement (excludes trial/travel size, value/gift/bonus packs) with this printable SmartSource coupon. Align is a probiotic that relieves and manages the symptoms of Irritable Bowel Syndrome such as abdominal discomfort, gas, and bloating. Align is the #1 Gastroenterologist Recommended Probiotic Supplement Brand (Symphony Health Solutions 2014 survey). 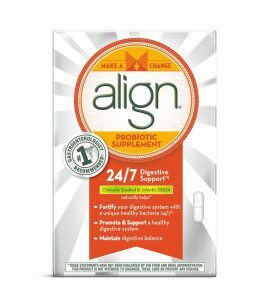 Only Align contains Bifantis, a unique, patented probiotic strain that supplements your body with good bacteria. Align comes in a convenient capsule formulation that you take just once a day, each day. By taking Align probiotic supplement, you can relieve and manage your IBS symptoms. Learn more about Align products.